Bob and Gracie Ekblad work with prisoners, refugees and displaced people all over the world. Bob will be speaking at Regent College October 16. For a number of years my daily prayer and study time includes reading online national and international news articles, preceded and followed by readings from the Psalms, Gospels and Epistles, and often from the Torah and Prophets as well. Reading the news, however, can become an addiction, especially in times of turmoil. The narrower path of seeking wisdom from above involves listening prayer, faith, intercession and continual discernment – activities that require time and sometimes can’t compete with carefully crafted and entertaining media propaganda. Even the best news coverage of current events is always incomplete, leading me to read deeper to seek understanding. Since the news media rarely focuses on good news and never on testimonies from the front lines of ministries committed to advancing the kingdom of God, deeper analysis can lead to negativity: anxiety, fear, despair, anger and cynicism. For years I have sought to practice what Swiss theologian and resister to Nazism Karl Barth reputedly advised young theologians: “Take your Bible and take your newspaper, and read both. But interpret newspapers from your Bible.” More than ever these days I am seeing the need to deliberately and prayerfully interpret current events from scripture. As I witness the USA (and other nations) severely divided, with people of opposing viewpoints citing their trusted sources and debunking others as under the sway of ‘fake news’ or propaganda, I’ve become convinced that Psalm 1 [see below] is highly relevant to our current national scene. “What does it mean to walk according to the counsel of the ungodly?” I’ve been asking myself. The “ungodly,” sometimes translated “wicked,” is from the term rasha in Hebrew. Its opposites are “the righteous” and those who pursue justice and righteousness. The ungodly are not just obvious thugs, but designate people not following the ways of God, the proud and arrogant (Isaiah 13:11), rulers (Isaiah 14:5) and the rich (Isaiah 53:9). For my counsels (boule) are not as your counsels, nor are my ways as your ways, says the Lord. But as the heaven is distant from the earth, so is my way distant from your ways, and your thoughts from my mind. Jesus spoke often about contrasting sources of intelligence. “He who comes from above is above all, he who is of the earth is from the earth and speaks of the earth” (John 3:31). “You are from below, I am from above; you are of this world, I am not of this world” (John 8:23). “Sitting in the seat of scoffers” is a popular pastime in America these days. In our highly polarized nation, the media and ordinary people daily pour contempt on opposing leaders and their followers. There is something almost irresistible about sitting in the seat of scoffers as hate and superiority can be intoxicating. Mocking or judging can give you a feeling of power and control, and the illusion that you are doing something rather than being stuck in paralysis, doing nothing. But there is something positive and life-giving to be done! The Psalmist continues: “But their delight is in the law of the Lord, and on his law they meditate day and night.” Don’t worry! “Law” here is not referring to laws or rules, but comes from the Hebrew word Torah, referring to divine teaching designating even the first five books of the Old Testament. Pursue delight day and night, the Psalmist is saying, which in times of negative media bombardment can help us “not be overcome by evil but overcome evil with good” (Romans 12:21). Delight in God’s teaching can be pursued through prayer, study, contemplative reading of scripture and worship. Once we have tasted delight we will desire more. This can lead us into a continual, day and night pursuit of divine counsel leading to a blessed life. The one who mediates day and night will be “like a tree, planted by the streams of water, which yields its fruit in its season. And its leaf does not wither. And in whatever that one does they prosper” (Psalm 1:3). In contrast is the bleak prognosis for the wicked, who “are like the chaff that the wind drives away . . . The way of the wicked will perish” (Psalm 1:4-6). So how do we step deeper into a lifestyle of preparation? How do we meditate on the word day and night? Interestingly the word for meditate in Hebrew is haga, meaning “moan, groan, murmur, utter.” Haga suggests deep engagement. Meditating is less an intellectual activity and more a deep vocal or silent ruminating, which seems more possible as a continuous activity. In the same way the Spirit also helps our weakness; for we do not know how to pray as we should, but the Spirit himself intercedes for us with groanings too deep for words. Praying in the Spirit then can be associated with a kind of internal groaning that overlaps with meditation. We can engage in a kind of ceaseless prayer and meditation “in the Spirit,” even when we are sleeping or working with our minds, as meditation and prayer can be done with our spirits apart from our minds. I encourage you to try this out, deliberately seeking the wisdom that comes from above leading to abundant life, over the earthly wisdom and human counsel. See if this helps you tune into messages of hope leading to fruitful resistance to the encroaching darkness of these dangerous times. Bob Ekblad was a keynote speaker at Missions Fest earlier this year. 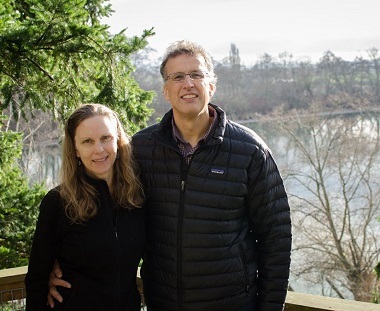 With his wife Gracie, he is co-founder of Tierra Nueva in Burlington, Washington. Tierra Nueva serves immigrants from Mexico, inmates, ex-offenders, the homeless and people struggling with addictions. This comment from his blog is re-posted by permission. Sure needed to hear this word today! One of the things we can do as Christians is to encourage each other and remind each other of God’s purpose in our lives. This is always so very important but just now, with the natural disasters affecting the planet as well as divisive political situations, this is so very golden. Bless you!